Kanji, hiragana and katakana are all well represented in this typical newspaper article; there are also a few words in the roman alphabet. The red box shows the kanji 奎 that is unusual and most people don’t know it, so its sound is placed by its side in hiragana, i.e., 奎 sounds ‘けい’ (kei); these small hiragana characters that indicate the sound of an unusual kanji are called furiganas. 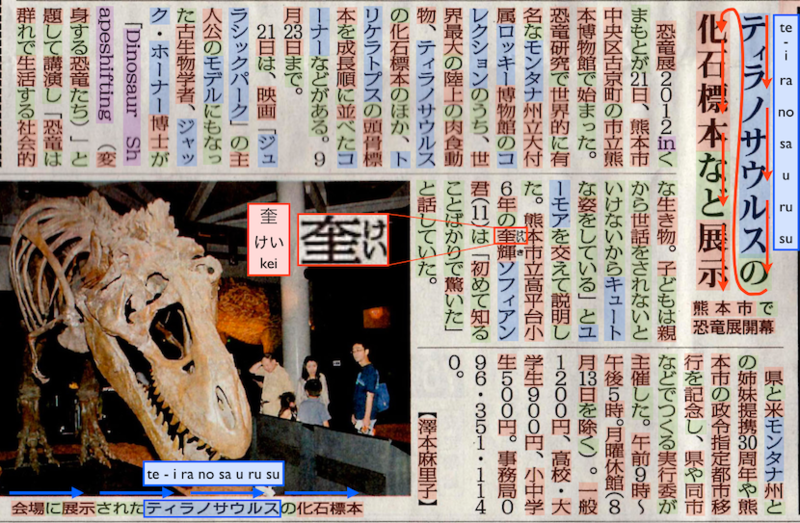 On the top-right of the article we find the word ‘Tyranosaurus’ written in katakana as ティラノサウルス (ti-ra-no-sa-u-ru-su), from top to bottom, as shown by the red arrows. This is the traditional Japanese writing direction, i.e., vertical, from top to bottom, and read from right to left. Most novels and books are written this way. On the bottom-left corner we find the word ‘Tyranosaurus’ again, this time written horizontally, from left to right, as shown by the blue arrows. This way of writing Japanese is identical to that of most indo-european languages. Nowadays, both vertical and horizontal directions are common in Japanese writings. In Japanese there are no spaces between words so using the different writing systems helps breaking up the text into words, i.e., parsing the sentence. With respect to numbers, this article uses Arabic numbers (1, 2, 3, 4, …) almost exclusively, a popular alternative to writing them in kanji (一, 二, 三, 四, …). Although it is no the case here, commonly we write numbers in kanji when we write vertically, and in Arabic when we write horizontally.